MOJA Cookie cutter set brings more fun to your family any time, especially for Christmas. It is a great cookie cutter for people who loves baking. Baking 3-D Christmas tree, reindeer, sleigh, and snowman cookies will also bring lots of fun with your kids. There are 8 different design pieces that can cut out to create the 3D cookie. It shows how many cookies you will need to create a complete set of Christmas scene at the back of the packing box. 1. Roll out the cookie dough to 1/5inch thickness evenly on cookie baking pan. 2. Take out the cookie cutters, and press them into the dough. 3. Remove the extra dough that is outside of shapes, and the cookie cutters. 4. Place in oven, and bake for 15 minutes at 320 Fahrenheit. 5. Finally, create 3D cookie with joy. •Wash the cookie cutters with warm soapy water before use. •You need to flour them before you push them into the dough. It makes them slide out easier without damaging the shape. •Don’t make the cookies too thick or they won’t fit together properly. 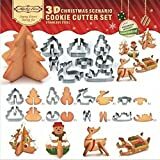 •Separate them from other cookie cutter set to make sure they won’t be bent or damaged.